Mad Mumsie and I are just a couple of retired folks who thought it a good idea to buy a modest motorhome, not only to explore Continental Europe, but to use as a base for holidays in this country with the grandchildren. And then we found out how much a motorhome costs... Oh dear! With van conversions priced at anywhere from £30-60k a new one was way beyond our means. The second-hand ones we could afford meant something in the ten or more years-old range, often with tired interiors. There was also the problem of older diesel vans meeting the emissions limits being introduced where we live. We thought we were stuck; it looked like going back to a caravan - then we discovered - The Self Build Motor Caravanners Club (SBMCC); a grand body of folks with great knowledge and experience who share a passion for self-building. 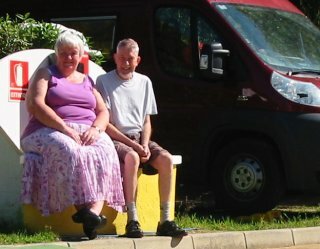 Even though we are lifelong diy enthusiasts (due to poverty from a mortgage and sending one's children to university), it had never occurred to us to build our own motorhome. What a splendid idea! 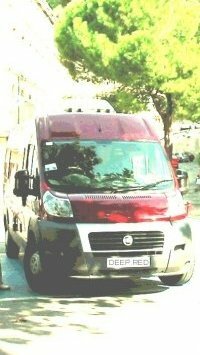 We do enjoy hearing from other self-builders and will always try to answer questions about the work we've done on Deep Red, but please bear in mind we are not experts at van conversions and cannot answer questions about products or methods we have not used. If we are away from home there may be a delay in answering. Contact us at: ian 'at' deepredmotorhome 'dot' com.